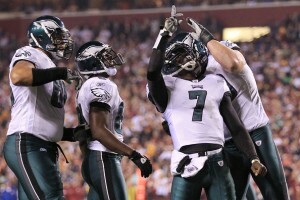 Michael Vick Had The Best Game of His Career The Last Time He Played Washington.. 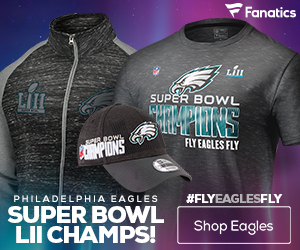 The Philadelphia Eagles (1-4) have struggled consistently throughout the beginning weeks of the 2011 NFL season, and are now looking down the barrel of facing the NFC East leading Washington Redskins (3-1). The Eagles pulled what most would consider a typical ‘Dan Snyder’ off-season and went-out to sign the biggest and most expensive free agents on the market, and it so far has not paid dividends. Washington on the other hand, stuck with their core group of guys, minus obviously Donovan McNabb, and they have found some early success. I don’t care what the Redskins record is or how Rex Grossman’s stats have shaken out so far this season — he is still Rex Grossman. Washington has already won one tight division game against the Giants, and lost a bad-one to the Cowboys on the road. In both performances, Grossman has been nothing more than average, and has relied heavily on the running game to throw down field. The Eagles corners are better than any team Grossman has played thus far, and they should be able to capitalize. Michael Vick has been taking too many shots this season, and much of that is due to the offensive line. But a simple solution on how to eliminate a portion of the hits is to utilize the running game to slow down pass-rushers, something Reid hasn’t tried yet this season, or really ever in his coaching career. Last week’s game proved that every shot that Vick took had an immediate impact in the game, and is one of the reasons Philadelphia lost last week. LeSean McCoy is good enough to play for four quarters, and Reid will utilize him this game. The Eagles have struggled for what seems like forever with covering opposing tight ends. This will inevitably hold true, as the Eagles defense will be tasked with containing one of the best receiving tight ends in the game in Chris Cooley. Seeing how Cooley has essentially steam-rolled the Eagles in every game he has played, I don’t see that changing anytime soon. Not to mention he is also the Redskins best receiver, and Grossman targets him often. Defensive mistakes, stupid challenges, and generally bad timeouts have plagued the Eagles during the Reid Era in Philadelphia, and he somehow manages to be even worse in division games. It was bad last week in Buffalo, and Washington has a much better all-around team than the Bills. I don’t see how Reid would be able to make a radical coaching change so quickly. This has doomed Philadelphia in the past, and I am sure it will hurt them this game. Generally I don’t predict the outcome of the game in the five listed predictions, but in this case I feel it was warranted. Philadelphia has spiraled out of control since week one, and desperately need a win before the season totally tanks and they lose their shot at the playoffs. This sort of performance is not the Eagles we have watched over the last decade, and this is a total shock to everyone, including the team. 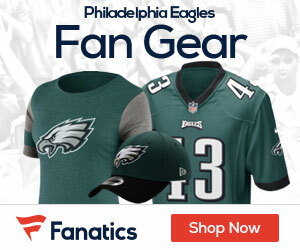 The Eagles realize what is at stake here, and the importance of this game against the Skins’. Philadelphia will go on the road and win the game to start the much needed comeback this season.